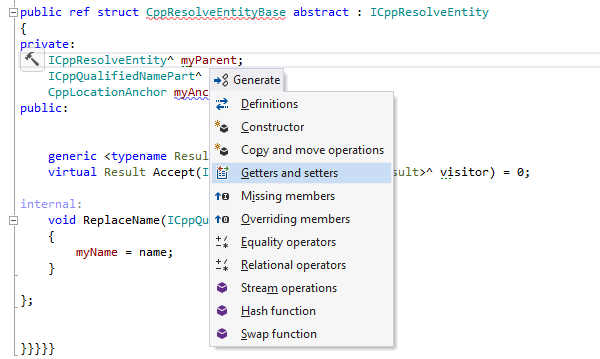 ReSharper C++ highlights code issues in the editor and provides quick-fixes to improve the code in one way or another. Unreachable code? Redundant statements? Suspicious object slicing? Incorrect format specifier? ReSharper C++ will bring these and other kinds of problems to your attention and help you to fix them. You can instantly jump to any file, type, or type member in a solution. You can search for usages of code and get a clear view of the found usages, with the grouping and preview options. Last but not least, you can go from any code symbol to its declaration or definition, its base or derived symbols. Code refactorings for C++ help you safely change your code base, which is especially important in a language as complex as C++. Context actions help switch between alternate syntax constructs and serve as shortcuts to code generation actions. Code that ReSharper C++ can generate for you includes definitions, missing and overriding members, equality and relational operators, and hash and swap functions. Add to this dozens of customizable templates, and you have the tools to deal with boilerplate code more effectively than ever before. ReSharper C++ supports running Google Test and Boost.Test based unit tests in Visual Studio. You can run and debug unit tests contextually, right from the text editor. Dedicated tool windows help you view, group, filter, and run unit tests, and create and manage unit test sessions. Configure the code formatting options and naming style, and share settings with your teammates; maintaining a consistent code style should never again be a problem. Find dozens of improvements made to code refactoring, code analysis, and navigation. Improve your code with the help of new context actions. Read code easier with the more detailed error diagnostics in the templated code, C++ name hints, and the improved parameter info popup. Select from one of the predefined C++ naming schemes or let ReSharper C++ auto-detect the code formatting settings for you. Two types of project will especially benefit from this release. The first type is C++/CLI (requires ReSharper Ultimate), which gets new Generate actions to generate equality operators, hash function, getter and setter, constructors, and an ability to create a derived class, struct, or interface. The second is Unreal Engine. To start with, the initial project opening happens much quicker now because ReSharper C++ only parses non-engine files during the initial indexing, while the engine files are indexed in the background later. Another addition is that the reflection macros like UCLASS, USTRUCT, and UENUM are all handled much better in the editor, even if a project has never been built before. you will enjoy ReSharper C++ as well.